Sophi Reaptress skull bath bombs! So happy I snagged one! Little Haus of Horrors always has the best stuff! Michael decided to join the festivities as well! rocked back and forth on the rocking chair. Bravo, little ghoul! Crude Inc. art and tees (I really wanted that horror movie slashers tee)! Prettiest booth goes to Haunted Manor, who had all manner of gorgeous items! Best tee - this Craft-inspired one by Lady Moon Co.! Lively Ghosts and their adorable pins and pin boards! Discount Cemetery had some rad tees! Wish I snagged one! The astounding Auzzy Blood puts on a side show for attendees! I love Save the Panduhs! Such amazing mash-ups of different characters! This "Time Out" chair for sale was adorable and hilarious! So many spooky creeps made it out to the Spook Show this year! I think it was their highest-attended one yet! This spooky on stilts was my fave! So very creepy in every wonderful way! with the audience. I can't wait to see them perform again! Ahhhh and this was my haul! Ummmm, I went a little crazy this year! I think I got everyone I purchased things from! I like posting the vendors so if you see something you like you can order it online from them. I want you to be able to take part in the Halloween fun in springtime even if you weren't able to attend Spook Show! 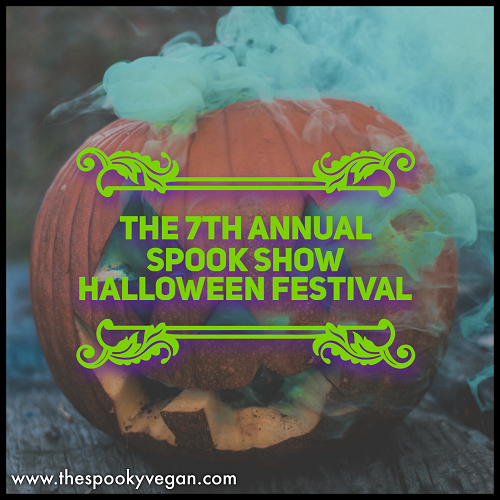 Which is why I have partnered with some fantastic vendors and am putting together a prize pack of items I collected at this year's Spook Show for one very lucky winner! You definitely don't want to miss this giveaway that will be unveiled later this week on my Instagram! Stay spooky, my creeps, and Happy Springoween!